In the late 1800s, Hercules Sanche, an itinerant businessman who claimed to be a doctor, devised a subfield of medicine called diaduction. Sanche believed that an undercurrent existed between all natural organisms and a disruption to that current resulted in illness, or “Devitalization.” The body, according to diaduction, craved oxygen — and “Revitalization” was achieved only when it was restored. Enter the Oxydonor Victor, a piece of medical quackery custom-made by Sanche that promised to provide that vital, missing element. It cost a princely $35 and was buttressed by hyperbolic testimonials (a requisite, it seems, of the patent medicine era). The Oxydonor could treat any and all ails, Sanche extoled, so long as it was used properly. 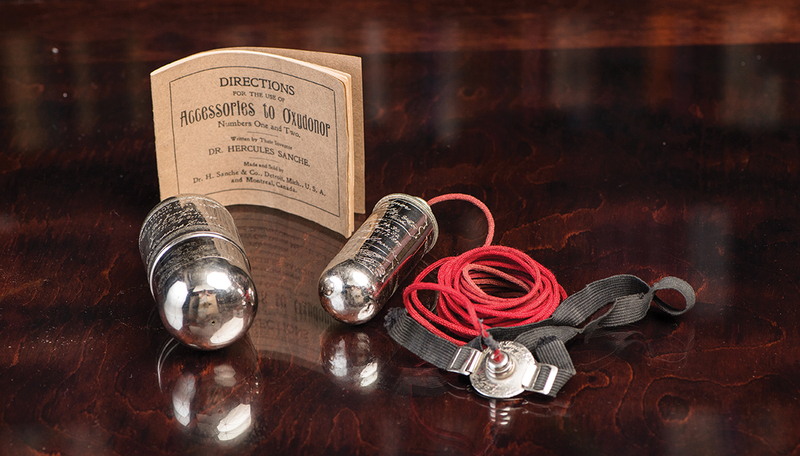 Consisting of a long rope connected to a tubular piece of metal — the “Vocor” — and several “contact discs,” the Oxydonor was affixed to the wrists and ankles with elastic. For best results, the Vocor needed to be submerged in ice-cold water. Sanche’s sham was eventually exposed by the U.S. government, and he took his products to Montreal, where they continued to be sold and marketed until the 1950s. Sullivan-Fowler, Micaela. “The Giver of Oxygen: Hercules Sanche and the Oxydonor.” Journal of the Medical Humanities.